We assume that your work will be gardening, landscape or tree work. Main purpose of contract is disclaimer of liability for professional work. Also sets out your requirements for work: specification, accessibility, and of course, for payment. 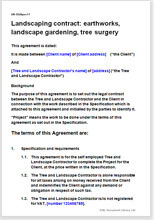 Just add specification for actual order each time you use it, and you have contract form suitable for private client who would not have been happy to sign long legalistic document. Just add specification for actual garden, tree or landscape work. As a tree and landscape operator, you need protection. If you have not arranged for up front payment you are always at risk that your client will not pay. We give you the option of several alternative payment procedures from all up front to all on credit. Limitation of liability also features large in this contract.